The combination of Skype for Business and Polycom systems provides a scalable solution suitable for businesses of different sizes. There are different Skype for Business packages and Polycom systems available to suit any budget or collaboration requirement. These solutions can provide a flexible infrastructure for meetings of two people or events of up to 10,000 participants located anywhere in the world. Skype for Business offers a clear migration path from Microsoft Lync or Skype to protect investment for organizations with existing installations. 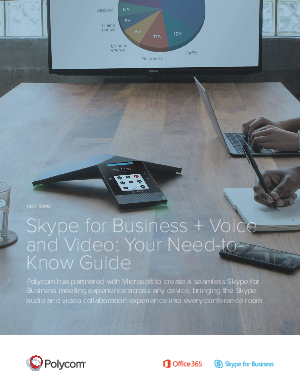 For growing businesses or organizations that are new to collaboration, the partnership of Skype for Business and Polycom provides the portfolio and the flexibility to add features and services to suit changing collaboration needs or scale capacity in line with business growth.